The Vulcan Statue on Red Mountain overlooking the city of Birmingham is in the running to become the 8th Wonder of the World. The website Virtual Tourist is running a contest where you can vote on what should be the 8th Wonder of the World. 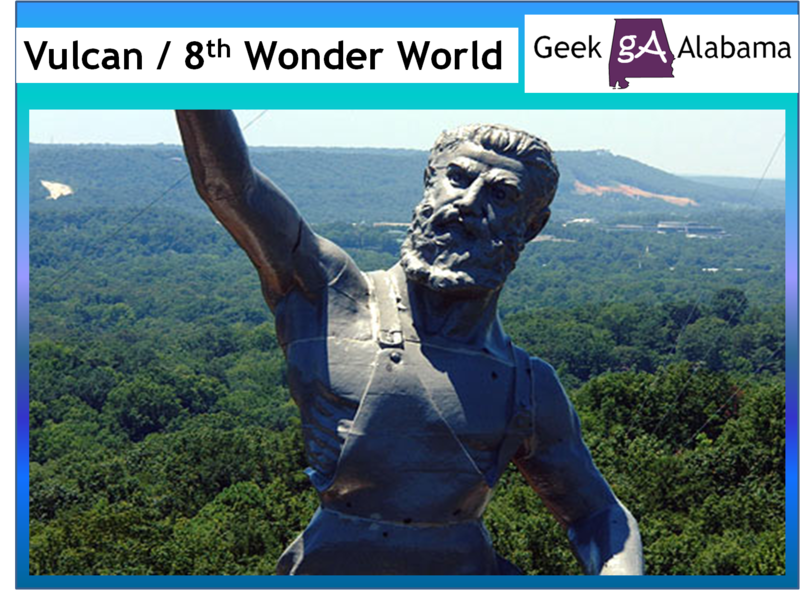 The Vulcan statue is the largest cast iron statue in the world, and is the city symbol of Birmingham, Alabama, reflecting its roots in the iron and steel industry. 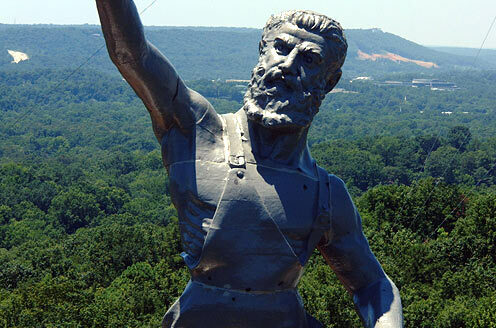 The 56-foot tall statue depicts the Roman god Vulcan, god of the fire and forge. It was created as Birmingham’s entry for the Louisiana Purchase Exposition (1904 World’s Fair) in St. Louis, Missouri. It is the seventh-tallest free-standing statue in the United States. Italian-born sculptor Giuseppe Moretti began designing the monumental figure in 1903. The Vulcan statue consists of 29 cast-iron components with connecting flanges that are bolted together internally. The heaviest section is his whole head, which weighs 11,000 pounds. Iron forgemen designed and executed the connection details for the statue, which originally had no internal framework and was self-supporting. The grey iron castings were made in Birmingham entirely from locally-produced iron. The completed weight of the god Vulcan’s figure alone is 100,000 pounds. When Vulcan’s anvil, block, hammer, and spearpoint are added, the statue weighs a total of 120,000 pounds and it now stands on a pedestal that is 123 feet tall. 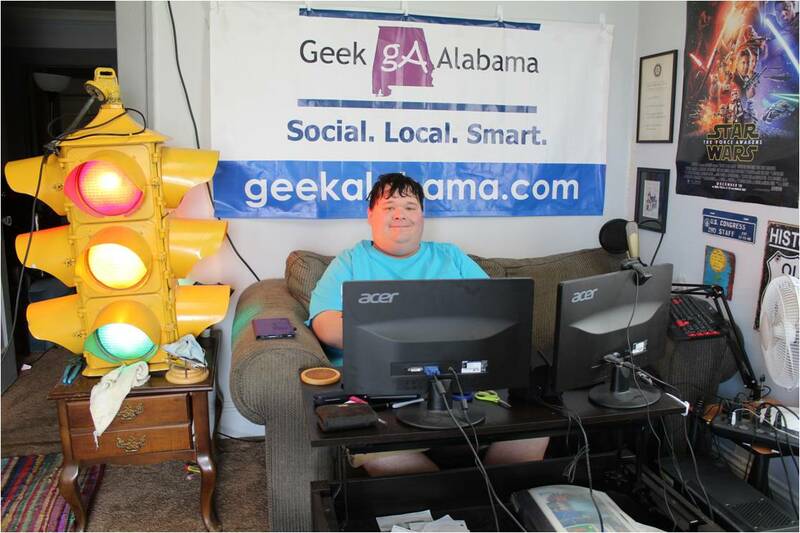 After spending time at the 1904 World’s Fair and at the Alabama State Fairgrounds. Vulcan was installed on a sandstone pedestal on top of Red Mountain in 1936. Instead of a spear, a neon torch was used that glowed green, except during the 24 hours following a fatal traffic accident, when it glowed red. In 1999, the statue was dismantled and sent to Robinson Iron in Alexander City for repairs. The statue was repaired and put back together in 2003 when it was put back on top of the pedestal. 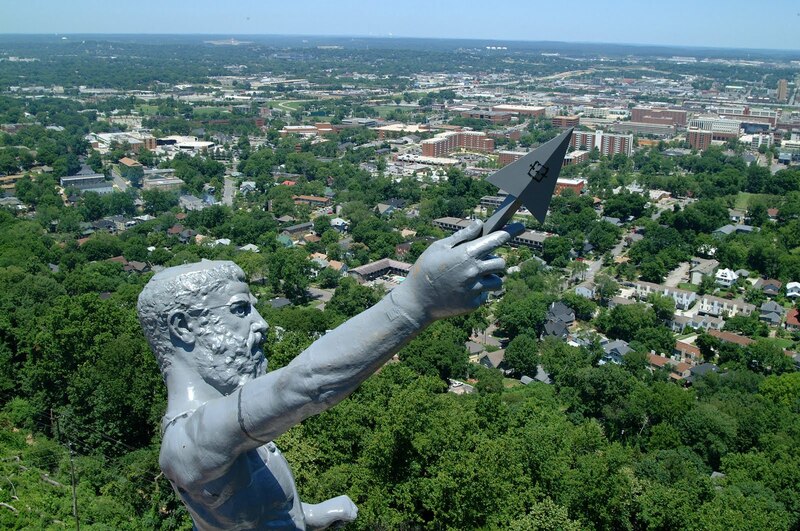 Today, Vulcan is painted Vulcan Gray and the statue is part of the Vulcan Park and Museum. Every year, a massive fireworks show is done at the Vulcan Statue on July 4th. Here is a video from the 2013 event!